It's no secret that I love cooking with Peruvian chiles; my two favorites are the mild, citrus-y aji panca and the bright, fruity, & hot aji amarillo. Since I live in Miami Beach, I can find flash-frozen whole peppers at my little corner neighborhood market, plus pastes, powders, dried peppers, and jars of whole peppers in brine. Check your local Latin American market to see if they stock Peruvian products. If you can't find them locally, the good news is that they are easily available online. 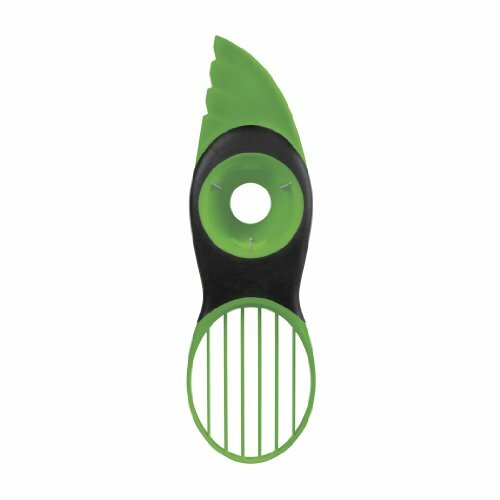 Check the end of the post for suggestions on where to purchase from. Veggies chopped and ready to mix with the ground beef. 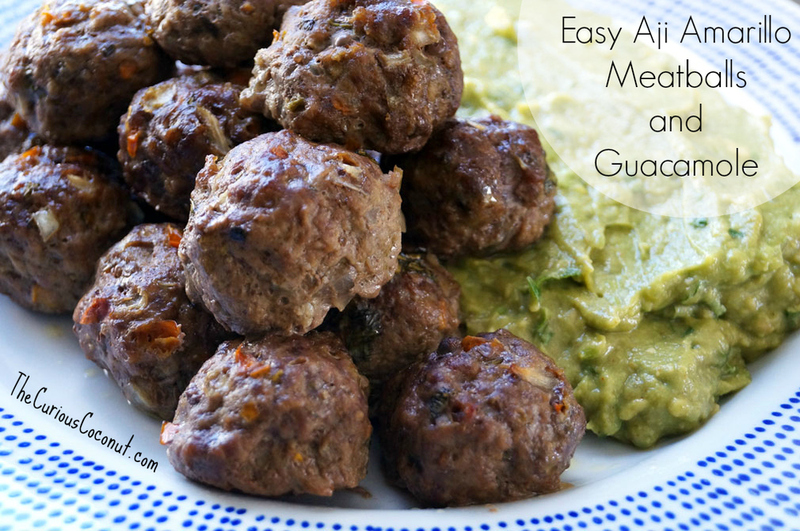 These meatballs (or a variation of them) + guacamole have become one of the top go-to quick meals in my house. I like to make a big enough batch to feed myself and my husband each twice -- these reheat very well (just put them in the oven at 350F for a few minutes, until heated). I was inspired to start experimenting with meatballs and guacamole thanks to a lovely recipe for Barbacoa Meatballs by Health Bent. I've made that recipe several times and, as written, it is wonderful. Sometimes I prefer to use freshly diced ingredients instead of dried spices (although using dried spices is quicker if you are really in a time crunch!) so I came up with my own variations, like the one below. I hope you enjoy it! Ready to go in the oven!! Note: you can get creative with the chile pepper that you use in your meatballs -- you don't have to use aji amarillo. Substitute a locally grown chile variety instead! Check with a local farmer (find one on Local Harvest) to see what they grow. Aji amarillo peppers pack a decent heat at between 30,000 and 50,000 Scoville units (source). That's right around the same hotness as cayenne. Adjust amounts accordingly if you use a chile with a different Scoville rating than aji amarillo. Peruvian-inspired meatballs with aji amarillo peppers. A quck paleo meal! Prep chilies, cilantro, shallots (or onion), and garlic and add to a large mixing bowl. Add salt and squeeze in fresh lime juice. Add ground beef to mixing bowl and use your hands to gently combine all ingredients uniformly. Use your hands to form the meatballs by rolling the mix between them. 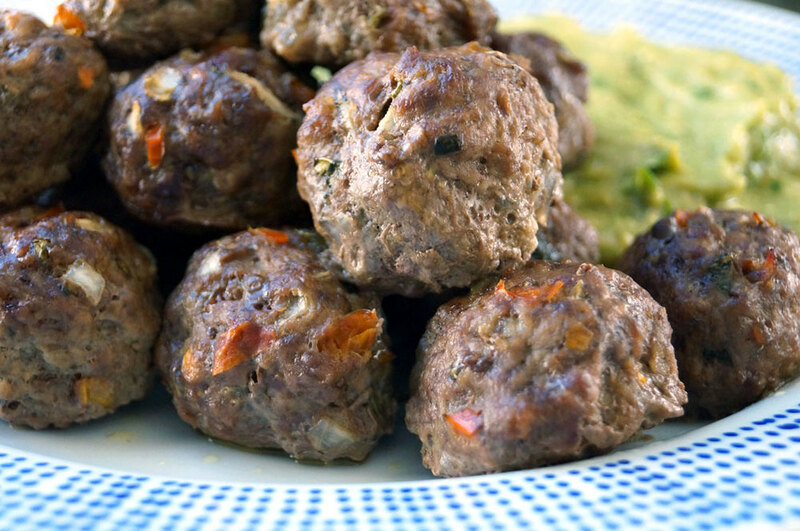 Aim to make 32 meatballs (from the 32 oz of ground beef). It's easy if you divide the meat mixture into smaller sections as you are working (in half, then in half again, etc.) You can make the meatballs larger or smaller if you like, but you may need to adjust the cooking time slightly. Arrange meatballs in two 9"x13" Pyrex baking dishes or similar -- do not use a cookie sheet without sides because fat and moisture will drain from the meatballs as they cook. Bake at 400F for 20-25 minutes, until slightly browned on top. Make guacamole: peel and remove pit from avocados and add to a bowl (I love my avocado tool for this!!) Mash with a fork until smooth and squeeze in lime juice. Add salt, shallots, and cilantro (and optional garlic) and mix everything well. My Sweet and Spicy Mango Chipotle Guacamole goes well with these meatballs, too! Serve immediately with guacamole of choice and enjoy! A few notes about the aji amarillo peppers: If you cannot get fresh or frozen peppers, the next best thing to use instead would be either whole peppers preserved in brine or rehydrated dried peppers. I am sure you could also use either the paste or the powder but I am not sure what the conversion would be; I know you would need to use a smaller amount compared to the above options, I just don't know how much less. I might try 1 or 2 Tbsp of the paste and maybe 1/2 Tbsp of the powder and adjust from there. The following links for products that I used in this recipe are from my affiliate partners. My full affiliate disclosure is here. I will receive a small commission if you make a purchase after clicking on one of these links, but you pay the same price as everyone else. 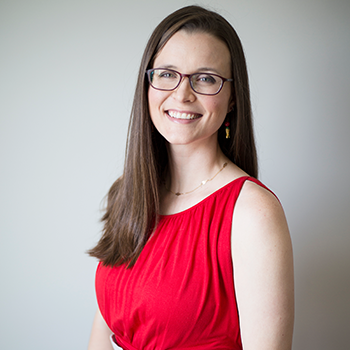 I appreciate your support and I only recommend products that I personally use and love and think you will like, too! Thanks so much for your support. 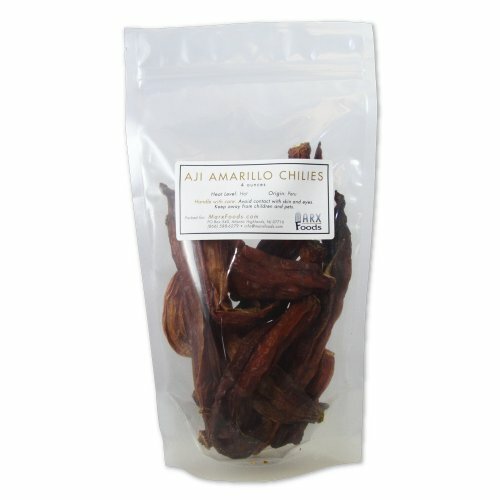 Costa Peruana, Dried Organic Aji Amarillo Chilies, 4 oz. 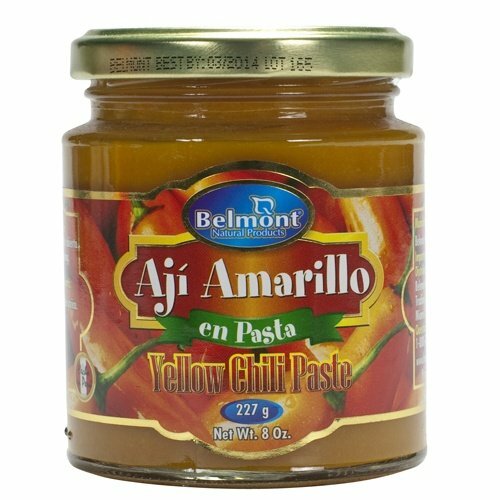 One of my favorite brands for Peruvian chilies is Belmont (paste shown above). They also make whole peppers in brine and the only other ingredients are salt and citric acid. 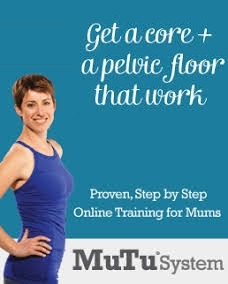 Sign up with your email address to receive emails with new blog posts from The Curious Coconut. We respect your privacy, and won't spam you or share your email address. Emails go out 2-4 times per month.